Climate change is a catastrophe in slow motion, and experts warn that the world will likely fail to stop it – with disastrous consequences for every country, including Canada. But cutting our greenhouse-gas emissions now could soften the blow. That was the Trudeau government’s rationale for a national carbon-pricing plan to encourage Canadians and big business to use less fossil fuels. Canadians will start to pay more for the gas they burn and the products they buy, but the cost will depend on where you live – and whether your province has its own carbon tax or whether Ottawa is imposing its own, as it did on April 1 in Ontario, Saskatchewan, Manitoba and New Brunswick. The ideological divide over carbon pricing has pitted parties and provinces against each other in the courts, in legislatures and in the buildup to this fall′s federal election. It’s more important than ever for Canadians to understand the facts about what is being taxed and why. Here’s a primer to get you started. Watch: What is carbon pricing anyway? Here's a quick visual guide. What’s being taxed: A carbon tax is a fee imposed on each tonne of emissions from fossil fuels, meant to help lower the amount of greenhouse-gas emissions. Under the federal levy, oil products such as gasoline and diesel, natural gas and coal-fired electricity are affected. What big business pays: Large industrial emitters will be covered by a different system and will be taxed on a portion of their emissions, based on how efficient they are relative to industry peers. This is meant to protect industrial competitiveness while still providing an incentive for companies to reduce emissions. Where the money goes: There are many ways the revenue can be used, such as offering rebates to customers, spending it on emission-reducing measures, lowering other taxes or including it as general revenue. What impact it might have: By one federal estimate, the combined federal and provincial carbon-pricing plans would reduce greenhouse-gas emissions by up to 60 million tonnes in 2020, equivalent to 8.3 per cent of the country’s emissions in 2015. But even with those reductions, plus the phaseout of coal-generated power and other energy-efficiency measures, Canada would still fall short of its total promised emission cuts for 2030 by about 79 million tonnes, Environment and Climate Change Canada said last December. Getting all the way to compliance with the 2015 Paris climate-change accord will require faster adoption of electric vehicles and public-transit improvements, the ministry said. 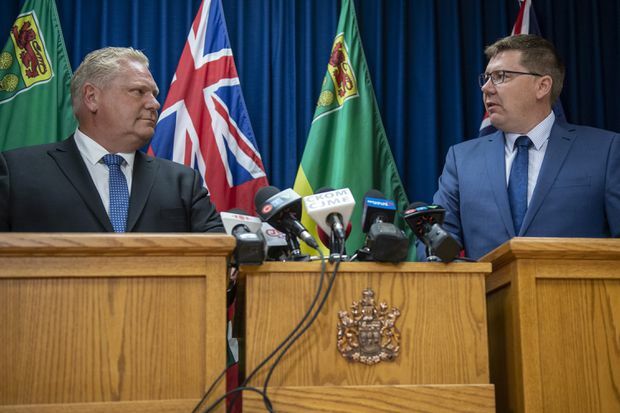 Premier of Ontario Doug Ford, left, and Premier of Saskatchewan Scott Moe during a media event in Saskatoon, Thursday, October 4, 2018. Both Premiers oppose the federal carbon tax plan. Where and when the tax is in effect: The federal levy, which came into effect April 1, applies to Ontario, Manitoba, Saskatchewan and New Brunswick, provinces that did not adopt their own carbon taxes, cap-and-trade systems or other plans for carbon pricing. (New Brunswick introduced a provincially run carbon tax, but the Trudeau government did not believe it met federal climate-change benchmarks.) Canadians elsewhere will be covered by provincial plans, either a direct tax or cap-and-trade system, and those governments must determine what to do with the revenue. Ontario: According to the federal government, the average Ontario household will pay $244 in direct and indirect costs for carbon, but will receive $300 under the “climate-action incentive,” for a net benefit of $56. Saskatchewan: The average family would pay $403 in carbon-tax costs and receive $598 in rebates ($195 as a net benefit). Manitoba: The costs will be $232 and the rebate $336 ($104 net benefit). New Brunswick: The breakdown is $202 and $248 (net benefit of $46). Why is the amount different in each province? The amounts vary from province to province because each jurisdiction relies on different amounts of fossil fuels, meaning there will be more or less revenue per person generated from the tax. The payments in each province − which will increase as the price per tonne rises − will be based on the number of people in a household and paid to one tax-filer. What is used elsewhere in Canada? The provinces not covered by the federal tax have their own carbon-pricing plans. For example, British Columbia’s carbon tax is $30 per tonne, which translates to about seven cents for a litre of gas. Some provinces also use cap and trade, including Quebec, Nova Scotia and, until this past summer, Ontario. How it works: It’s a system in which the government caps the total amount of carbon emissions allowed, then issues permits to companies specifying how much carbon they can burn. Allowances are sold at quarterly auctions and the results are published, so the public knows what regulated companies pay. If a company wants to burn more than its share of carbon, it must buy extra permits from other companies that have burned less. Over time, the government gradually lowers the cap, cutting the number of permits it issues and driving up their price. How it cuts emissions: The idea is that companies will either burn less in order to make money by selling their extra permits or cut emissions to avoid having to buy more. How Quebec and California do it: Quebec allows companies to buy credits from the state of California because it is less expensive to reduce emissions there. As a result, the cost is lower than it would be if companies were limited to purchasing credits within the Quebec market. How is cap and trade different from a carbon tax? Under a carbon tax, the government simply sets a price on carbon and everyone who buys a product that creates emissions must pay it. In theory, people will cut their carbon use over time to avoid paying the tax. Cap and trade, on the other hand, gives government more mechanisms to target the cost to industry, not just individuals. The Trudeau government’s solution for large industrial emitters resembles cap and trade, in that companies can purchase credits from other firms. Pro: It’s relatively easy to administer and straightforward to understand. Everyone pays the same price to burn carbon. Con: It does not set an exact cap on emissions. The government just sets the price and hopes that consumer behaviour will do the rest. Pro: Government can mandate the exact greenhouse-gas reductions it wants to see, and tailor the auction of carbon permits to reach those reduction goals. Con No. 1: Cap and trade is a lot more complicated than a carbon tax and can be gamed by industry. For example, if companies overreport the amount of carbon they are burning to begin with, government could set the caps too high and not actually achieve significant reductions. Con No. 2: The allocation of permits allows government to pick winners and losers. If one company’s industry has a really good lobbyist, it could convince the government to allocate more free permits to it, and fewer to other sectors – with potentially unfair results. Why is the carbon tax a big deal? Scientists overwhelmingly agree that climate change is a real and deadly threat to the world. The risk to Canada is particularly acute: A report in April from federal scientists warned that Canada is warming twice as fast at the rest of the planet. Countries already struggling with extreme weather and rising seas can expect to see deadly and costly disasters, climate refugees and social unrest in a few decades, according to a watershed report from the United Nations’s Intergovernmental Panel on Climate Change. But the researchers’ report also says cutting fossil-fuel use dramatically and soon could soften the blow, which is why countries around the world are scrambling to adopt policies like carbon taxation and cap and trade. Ottawa’s goal is to reduce emissions by 30 per cent below 2005 levels by 2030. Prime Minister Justin Trudeau argued the price on carbon emissions is a critical part of Canada’s commitment to the international effort to combat climate change and its dire impacts. The Liberals are also entering an election year and will want to make good on a promise made in the 2015 election to combat climate change. are relative to the 1986–2005 period. Projections are based on the Coupled Model Intercomparison Project (CMIP) multi-model ensemble. Changes are relative to the 1986–2005 period. The Conservative Party opposes the carbon tax and are trying to make it a wedge issue ahead of October’s federal election. Leader Andrew Scheer has threatened that the carbon tax is “only going to go up” if Mr. Trudeau is re-elected, and has supported a legal challenge to the carbon tax by provincial premiers (more on that below). Saskatchewan and Ontario are jointly challenging the Trudeau government’s carbon-pricing plan. Ontario’s Court of Appeal began hearing arguments in April. Ontario Premier Doug Ford was against a carbon tax before he took office last June. His government scrapped the previous provincial Liberal government’s cap-and-trade program in July, saying the province would adopt policies aimed at reducing emissions but not include any kind of tax or levy. For months, Mr. Ford has been rallying against the federal government’s plan alongside Saskatchewan Premier Scott Moe and Mr. Scheer. Mr. Moe’s government introduced its own climate-change law on Oct. 30, laying the groundwork for standards to reduce industrial emissions. Large emitters would be required to register with the province and could receive credits for reaching targets. But critics say the plan does not commit the province to mitigating greenhouse-gas emissions. Progressive Conservative Premier Blaine Higgs opposes the federal carbon tax and argues that it will put too high a burden on New Brunswick’s rural population, which has few alternatives to driving cars to get around. The province has filed its own legal challenge to the federal tax. Another challenger to the carbon tax entered the fray on April 16, when Jason Kenney’s United Conservative Party unseated the New Democrats in Alberta’s provincial election. Mr. Kenney, who made Mr. Trudeau and his carbon tax a frequent target of election-campaign rhetoric, promised to repeal Alberta’s carbon tax and replace it with a tax on large industrial emitters. He also wants to take a more aggressive strategy to build oil pipelines despite opposition from neighbouring B.C. and First Nations. One of the risks Canadians face from climate change is rising sea levels, which threaten to overwhelm coastal cities' infrastructure, flooding communities and hobbling ports. In a five-part series, Globe and Mail journalist Matthew McClearn investigated how five communities across Canada were rising to the challenge. You can also take a deeper look at the underlying science here. Halifax’s battle of the rising sea: Will the city be ready for future floods and storms?